My first encounter with Bircher Muesli was at a hotel where I stayed during one of my holidays years ago. The Bircher Müesli looked so pretty in shot glasses on the self-service buffet counter. I just had to try one and I am so glad I did. They were so delicious, I couldn't stop at just one! Under the dollop of yogurt, the shooter glass is filled with oats, nuts, and fruits! 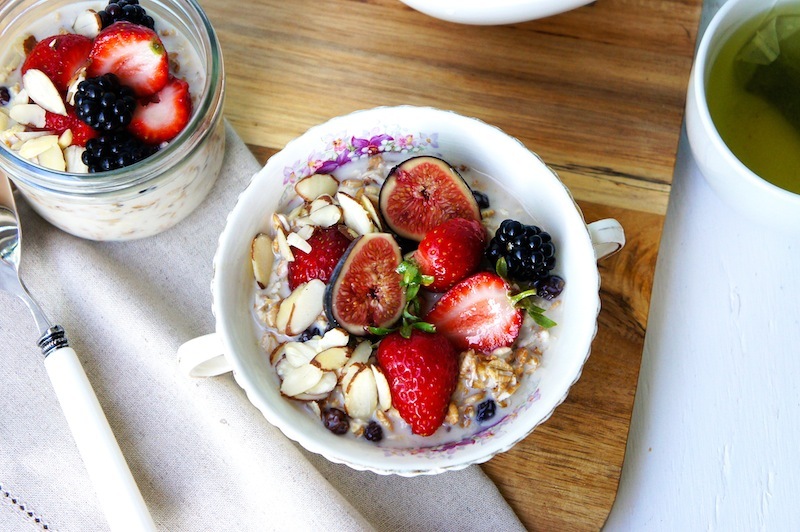 Bircher muesli was originally brought to the world's attention around the 1900s by the Swiss physician Maximilian Bircher-Benner. Even back then, a diet rich in fresh fruits and vegetables was an essential part of the therapy program. You can read more about it here. This recipe for Bircher Muesli With Seasonal Fruits requires soaking the oats, barley flakes, wheat, rye, flaxseed, raisins, and cinnamon in almond milk. 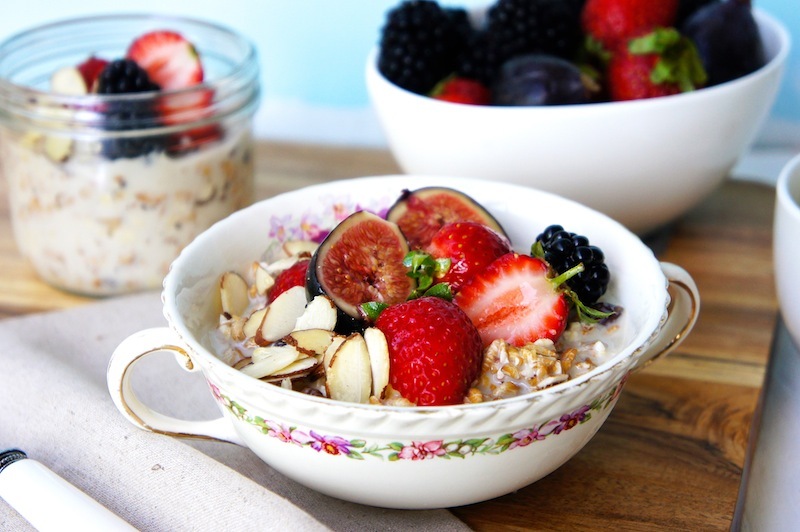 So, do make this muesli the night before for a quick and healthy breakfast the next day. Just before serving, mix in some fresh fruits, crunchy almond slices, and a good drizzle of honey on top. Suggest serving it chilled during the summer months and slightly warm during the winter/colder seasons. This is another perfect "pick-me up" breakfast! Have fun making this version or feel free to experiment with any fruits, nuts, or juices combination of your own choice. Enjoy! Combine, muesli, sultanas, almond milk, and a pinch of sea salt in a bowl. Cover and refrigerate for about 6 hours or overnight. To serve, mix in the yogurt (if using), some cinnamon and top with fruits, almond slices, and a good drizzle of honey. Serve chilled or warm.